At the Township of Onslow Meeting held on the 13th of September 1763 it was voted, “That the East side of the Island in the Uper Mash be aloued and sequestred for a buring place.” (Israel Longworth, Q.C., Truro c. 1880). In 1901 an Act of the Nova Scotia Legislative Assembly incorporated the Trustees of the Onslow Cemetery Company. Its provisions have guided the management and care of the cemetery to the present day. It is one of the oldest cemeteries in Nova Scotia and one of over a dozen graveyards in Colchester County containing the remains of the Planters (see Planter Burying Grounds for more info.) who arrived here during the 18th century. Visit our news section to see our latest Newsletter. 1898 map of the cemetery. 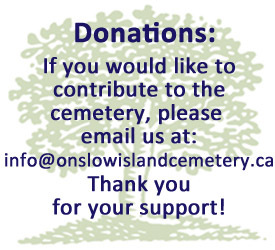 The 2019 Annual General Meeting of Lot Owners and Friends of the Onslow Island Cemetery will be held on Wednesday, April 3, 2019 at 7:00 pm at Trinity United Church Parlour, Upper Onslow, NS. The agenda will include reports on finance, Board activities and the Nominating Committee re trustees for the coming year.